The Pantheon inspired the greatest architects of the Renaissance, so much that Raphael wanted to make it his eternal resting place, and Michelangelo considered it the work of angels and not men. 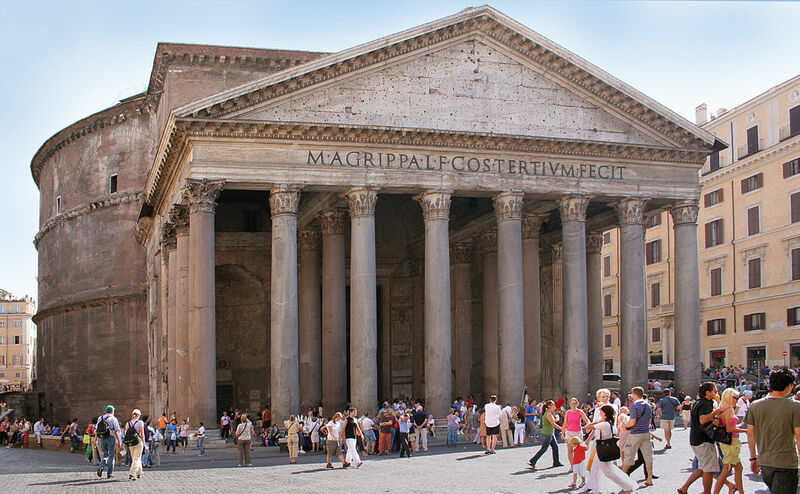 Originally the Pantheon was built by Agrippa between 27 and 25 BC and he dedicated it to the worship of all the Olympians. The word “Pantheon” in fact comes from the Greek and literally means (temple) “of all Gods” (“pan” = “all” and “theon” = “divine”). However, Agrippa’s original construction was damaged by two fires, in 80 A.D. and 120 A.D. and was completely rebuilt by Emperor Hadrian between 118 and 125 A.D., preserved substantially intact to this day. 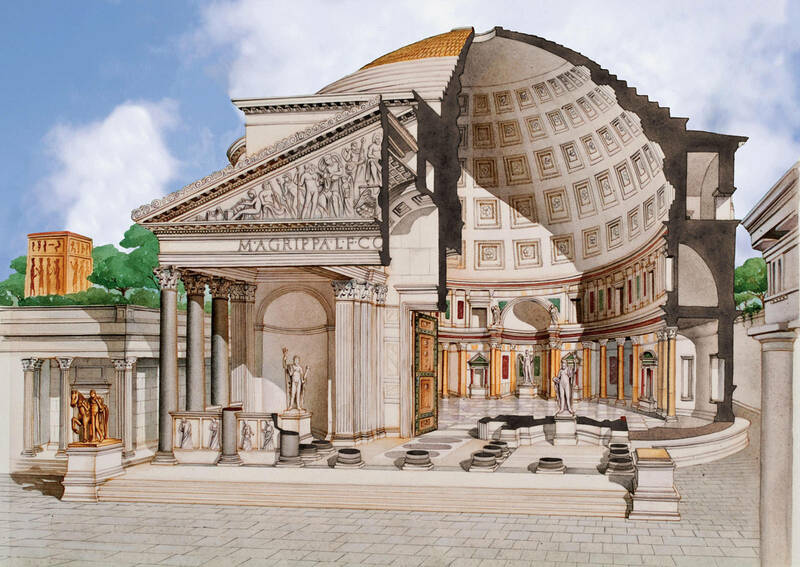 Do you want to see how the Pantheon was in the past compared to its present state? Use our tool below. 1) The dome of the Pantheon, with a diameter of 43.30 meters, still remains the largest dome in the world, surpassing both the dome of St. Peter (diameter 42.52 m) and the dome of Brunelleschi in Florence (lower diagonal 41.47 m) . 2) The inside of the dome is decorated with five rings of twenty-eight coffers, or sunken panels; twenty-eight was a number that the ancients considered perfect, since it’s obtained from the sum 1 + 2 + 3 + 4 + 5 + 6 + 7 and seven is a number that represents perfection, because seven planets are visible to the naked eye. 3) The diameter of the chamber is 43.30 meters and is equal to the height of the building; its interior could therefore contain a perfect sphere. 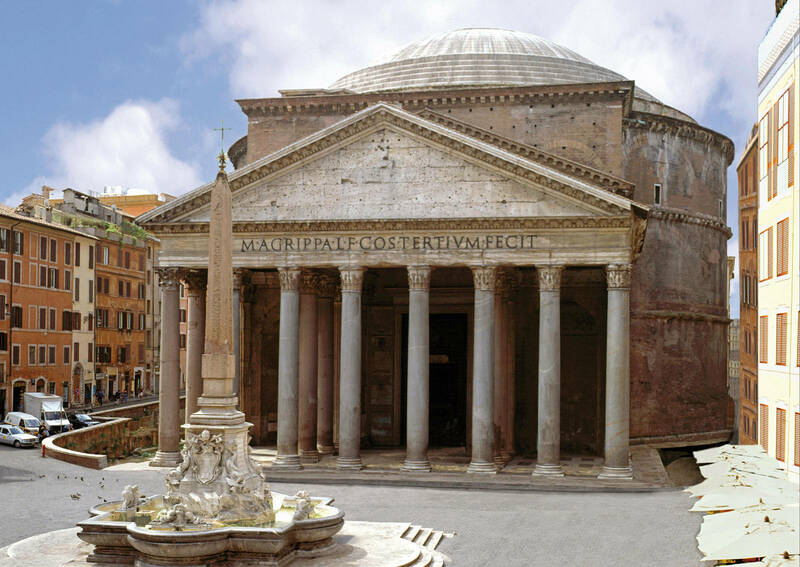 4) The pronaos of the Pantheon (ie: the front, preceding the entrance) consists of 16 columns, made of pink and gray granite quarried in Egypt. 5) Inside the Pantheon are the tombs of the first two kings of Italy, Vittorio Emanuele II and his son Umberto I. When it rains, does water enter the hole in the roof of the Pantheon? 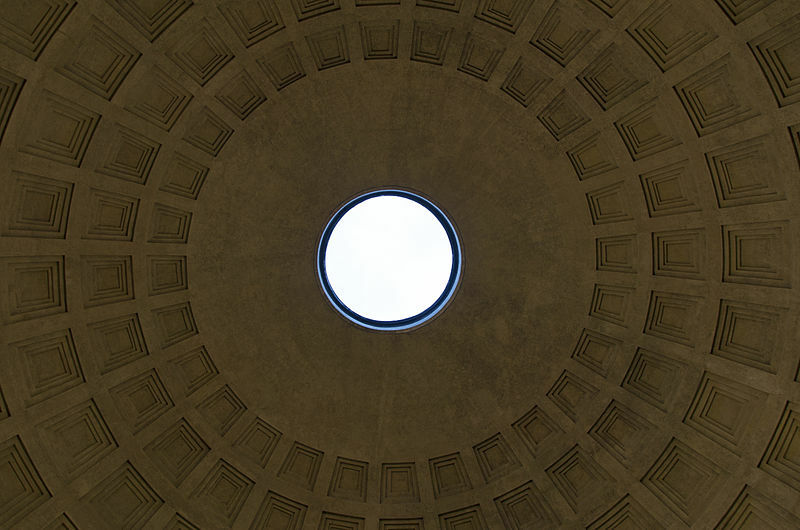 The most frequently asked question about the Pantheon continues to be, if it rains inside, through the hole in the roof. The answer is as surprising as trivial. Well, yes. Water enters through the 9 meters in diameter oculus of the cupola. The floor is, in fact, slightly convex, made in such a way as to run off the rain water into 22 manholes. 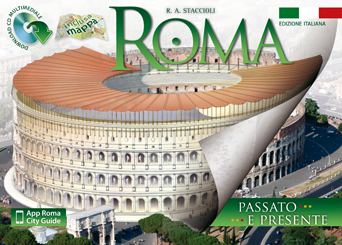 Do you want to know more about the history of the Pantheon and see how it was originally during the roman empire? 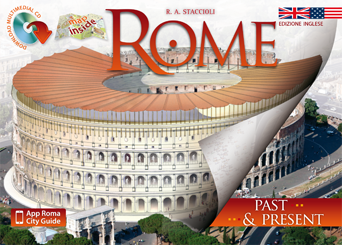 Check out our guidebook to Rome, with detailed history and Past & Present images of the Pantheon, the Colosseum, Trajan’s Market and all the greatest historical and archaeological sites of the eternal city. Notice: Opening and closing times are just an indication and they could vary. Check on the Pantheon website the actual opening and closing times for the days of your visits.